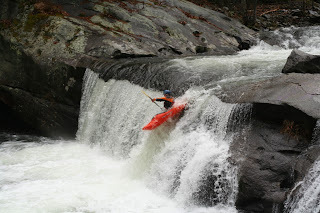 Tellico, Tellico, Tellico… I run it 3 times a day.. 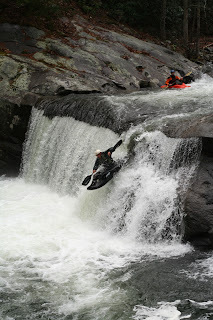 I had been watching the Tellico for over a year now, REALLY wanting to get on it and say that I paddled it. Unfortunately, everytime I was in Tennessee, it seemed that it didn’t rain. Today I looked at the level and it was closest to the minimum level for a good paddle, and I wasn’t going to leave without getting on that river. I convinced Stephen to take me there, and Brad, Mark and John decided to come along! I brought the new Punk Rocker with me, so not only was it the first day on a new river, but my first time in a creekboat as well! The drive was about 2+ hours to Tellico Plains, and once we got there and drove alongside the river, I was beginning to wonder if I made a terrible mistake. It was so SHALLOW! I could see the bottom of the river and there were rocks everywhere. Stephen reassured me that this was not the part we were going to run, and it is narrower and deeper upstream. As we drove further up, we started seeing boaters on the river, and finally saw Mark and John paddling down above Baby Falls. We stopped to get their attention, and took photos of them running the falls, before heading up to the put-in. As we were getting ready, Mark and John had managed to hitch a ride back up and put on with us, for their second run and our first. At first I was nervous. Paddling a creekboat was completely different than paddling a playboat or a river-runner. 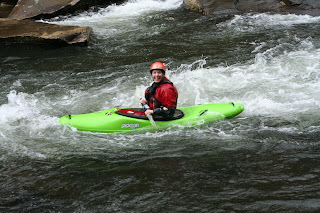 I practiced ferrying back and forth a current at the put-in, and then we headed downstream. 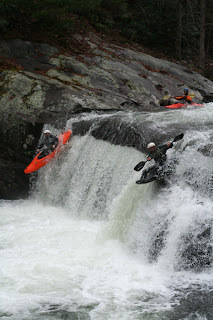 The upper part of the Tellico consisted of a series of ledges, where we got to practice our boofing skills. So far I was doing really well! I didn’t feel tippy, and felt solid and in control of my boat and my paddle strokes. The last of the ledges was a 10 foot boof with a seam in the middle. The idea was to boof over the seam, but as I couldn’t see exactly where it was from above, I managed to get sucked right down in the seam. I disappeared compeletely under water and quickly resurfaced. I rolled up right away. Damn! I screwed up my first boof! 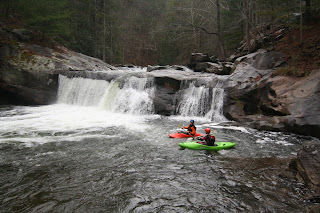 We went through a few more rapids, and finally came to Baby Falls. There was a tiny eddy above it that people catch. Stephen was waiting in the eddy for me, and I tried to catch it, but missed. I was now facing upstream just above the falls. I quickly turned the boat around and went over the far right side of the falls. I didn’t land right side up, and rolled back up quickly. 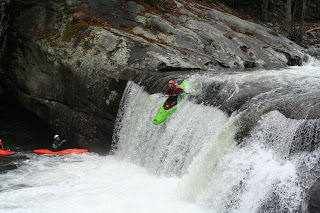 Below Baby Falls was a rapid called Diaper Wiper. For some reason I thought it was one of those rapids I needed to be careful on. We ran the left, which was a slide which made a 90 degree turn to the right at the bottom. I aced it! Yeah! We kept going on down the river, finally arriving at another “watch-for” rapid called Jared’s Knee. It was a complex myriad of rocks, chutes and ledges. I just followed the others down and was fine. At the take-out, I was feeling a little tired from all that paddling, but wanting more. Stephen hitched a ride back up and got Mark’s van. He ran shuttle and sat the second run off to run shuttle and take photos. The second run was a better run for me. I ran the entire run right-side up, ran the right line at Diaper Wiper and aced Jared’s again. It was just so much fun, I had to run it AGAIN! It was such a great day! I was grinning the whole way down, and now I want to get myself a creekboat! ← Three different rivers in one day!